The Meat Quarter as viewed to the north. The unused elevated train line based on the High Line is visible further down the road. 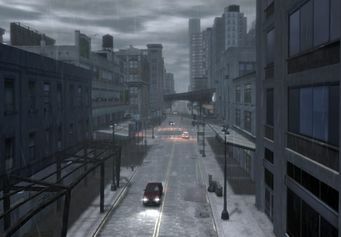 The Meat Quarter is a neighborhood in western Algonquin, Liberty City in Grand Theft Auto IV. It is bordered to the north by an access road to Union Drive West and a multi-story car park (Westminster); to the east by Frankfort Avenue (The Triangle); to the south by Garnet Street (Suffolk and Castle Garden City); and to the west by the West River. The Meat Quarter is a grittier, less polished and glamorous neighborhood of Algonquin that is currently in the throws of gentrification. The architecture in the area tends to be much less massive than that of the neighborhoods to the east in the heart of the borough. Walking through The Meat Quarter, especially in its central portion, one can easily note the influence of the area's past, which appears to have been dominated by industrial and manufacturing businesses. Indeed, there are many former warehouses and loading facilities that have since been converted for residential purposes. The eastern corridor along Frankfort Avenue is much more upscale in character, owing to its proximity to the more affluent, adjacent neighborhoods to the east. It features the tallest and grandest buildings of the area, all of which tower over the smaller scale architecture to the west. The neighborhood's western half, from Union Drive West to the West River, is the neighborhood's main commercial area, with a waterfront retail park and marina located along the extreme western edge. The neighborhood's major draw is Golden Pier, a large retail park/marina located along the coast of the West River, just west of Union Drive West and accessed via Hematite Street. Golden Pier stretches from The Meat Quarter north to Westminster. The retail park houses a number of public services including a bowling alley, a small park, a Burger Shot fast food outlet and a large golfing driving range situated along a pier. Maisonette 9 is also revealed in The Ballad of Gay Tony to be located in the northern fringe of the district, neighboring Westminster. There is a disused elevated freight line running through the heart of the neighborhood, based on Manhattan's High Line. The Meat Quarter is influenced by western Manhattan neighborhoods which lie along the Hudson River. The name itself is clearly inspired by Gansevoort Market, colloquially known as the Meatpacking District. The real-life neighborhood's impact on the GTA location can be seen in its architecture, as well, featuring several reclaimed former warehouses and packing plants. The neighborhood of Chelsea, Manhattan also contributes its own flavor to The Meat Quarter through the marina along the West River, which is clearly meant to mimic Chelsea Piers. The Chelsea section of the former High Line freight railroad is also depicted in the game. The Liberty City Subway serves the neighborhood at Hematite station, located in the retail park/marina in the pedestrian promenade. Auxiliary exits are located on either side of Union Drive West, just north of its intersection with Hematite Street and near a pedestrian overpass. It is served at all times by the Algonquin Outer Line.